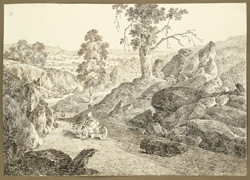 Pen and ink drawing by Sir Charles D'Oyly (1781-1845), of a view overlooking the descending road through the Kathkamsandi Pass in Bihar, from an album of 80 drawings of views in Bengal and Bihar taken between January 1823 and May 1825. The largest group (ff.2-39) consists of sketches made between 26 January and 27 February 1823 during a journey from Calcutta to Gaya (Bihar) along the 'New Military Road'. This road passed through Manbhum district (Bihar) to Hazaribagh (Bihar) and through the hills to the N.W. to join the present Grand Trunk Road near Sherghati (Gaya district, Bihar). Begun in 1782, it had semaphore signalling towers built along it in the early years of the 19th century. This is the original drawing for plate 11 of 'Sketches of the New Road in a Journey from Calcutta to Gyah' (Calcutta, 1830). D'Oyly wrote, "From the summit [of the Kathkamsandi Pass] is observed a low green beautifully dotted valley, from which to the right gradually rise Hills covered with rich foliage, and the horizon is bounded by a range of Hills, varying in their tones by recession, till they are lost in haze. From this spot there is but one descent, in some places steep and in others of more gentle declivity and when the Valley is reached and the eye is turned back to the pass, which has been left, the view is scarcely less striking. Distance from Calcutta 270 miles."